Just had a bit of a thought... I wonder if Palm Street was originally built without any drains? The houses would certainly not have had bathrooms when new and most likely no running water, so a foul drain to each house wouldn't have existed. So maybe they didn't bother with rainwater drains in the street either? The road had sewers from the outset (see below) and house sale details in 1865 stated that (at least some) had water and gas supplied. 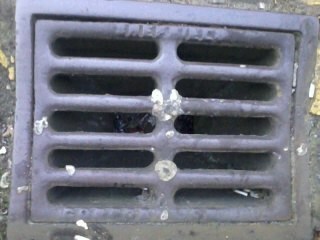 These to drain covers are on Lancing Rd, I did see one on Margaret St dated 1901 but a car was parked over it unfortunately. I was invited to a meeting with AMEY Streets Ahead which i attended this morning. AMEY officials said that many of the older drainage systems are going to be replaced and some grates and covers will have to be replaced. They said that anything interesting or historic should be reported to them so that every effort could be made to work around them. They said they have been in touch with museums, some of whom expressed an interest in re-housing Sheffield's historic pavement features. We agreed to keep in touch over the issue and i thinking about my next move. 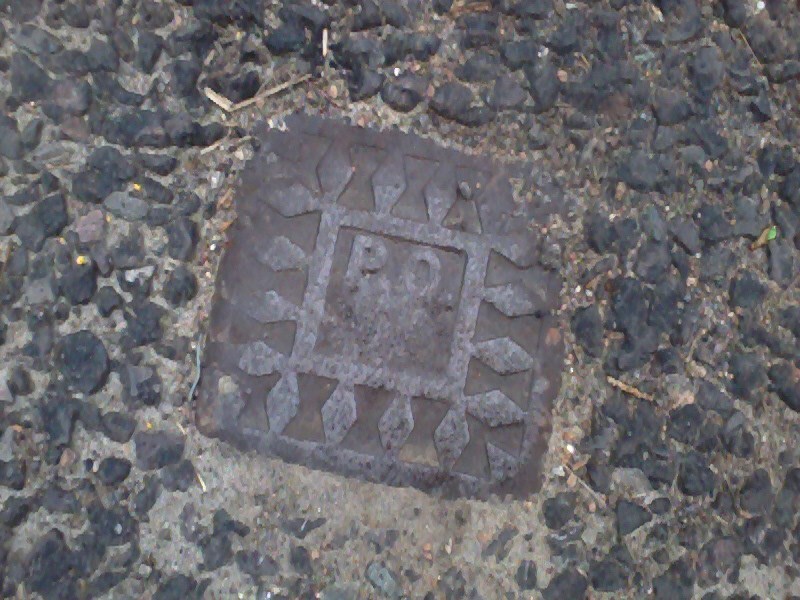 By the way AMEY did confirm that they do own anything that they remove from the streets during the refurbishment programme and such items are usually recycled, although they also admit that Victorian cast iron drain covers can also be worth up to £100 each. I informed them that i intend to apply for listing the most interesting historical pieces. I'm sure Amey won't be happy about listing when they can make a swift buck out of taking them out and replacing them with plastic ones. 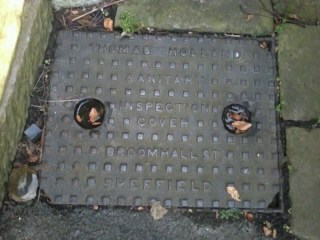 Just walk down a mile of street, count the drain covers, then miltiply that by the miles of streets in Sheffield! You can soon see why they're ripping stuff out and replacing it with tat! I think next move is every pre-1960 item of street furniture, whatever it is, should be catalogued and the list sent to English Heritage with relevant listing details for selected pieces. Remember anything canbe listed provided it is in it's original location and will be favoured if it is still in working order. A drain cover is still in working order even if the drain below it is blocked. What jack Scott said in the newspapers about old covers being dangerous to cyclists is absolute nonsence! The modern covers, which typically have much bigger holes, are far more dangerous. They've put some of these in where I walk my dog and I now have to be very careful when crossing the street because her paws could easily go down the holes in the new covers, resulting in a broken leg or worse! Theren can be no justification for ripping out street features that have been in place for so long. The only incentive to do this would be a joing 'get rich quick scheme' between Amey and some dodgy councillors to take valuable public assets and replace them with cheap rubbish. What other reason would they have for ripping out granite kerb stones, settes cast-iron lamp posts in tiny side streets while more major B and A roads which desperately need resurfacing all over the city remain neglected? 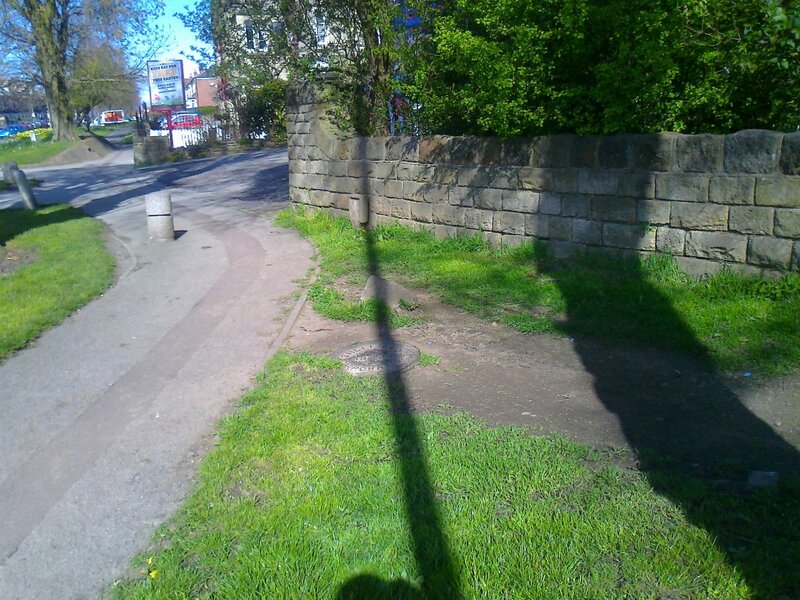 Also why have I STILL not has a reply from either the City Council or Councillor Nikki Bond at Nether Edge? The latter of these I personally spoke to at a recent Repair Cafe event held by the Nether Edge Neighbourhood Group, who were quite distressed to hear their three sewer gas lamps (which are listed and in full working order following a restoration sponsored by the residents about 10 years ago) are likely to be torn apart and converted to nasty modern electric LED bulbs, which will not only destroy the originality of the lamp but will also show a different brightness and colour tone of light which is totally out of keeping with the period surroundings. Returning to drain covers, my local friendly scrap dealers (nice people who I often send old car batteries to) tell me there is almost no scrap value in cast iron. 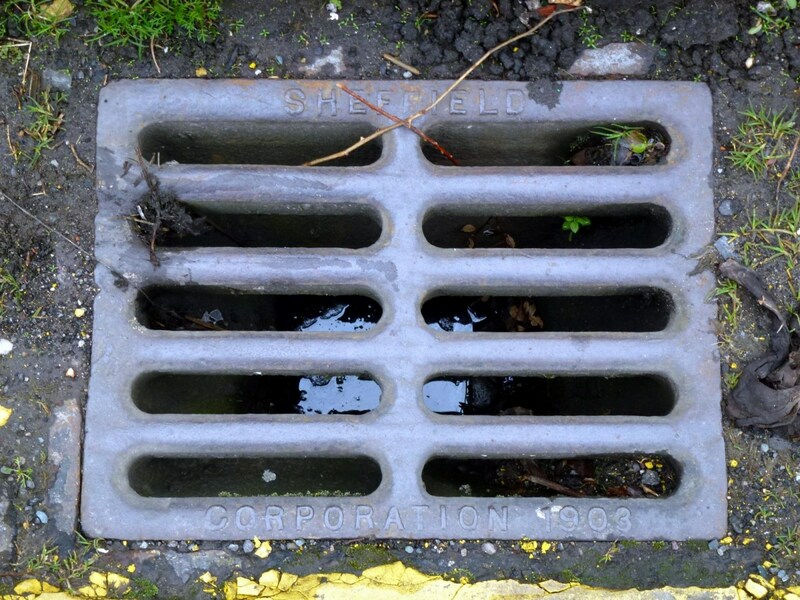 A typical drain cover would have a scrap value of about £5, NOT £100 as Amey suggest. The only way a higher price would be justified would be if they were sending them to a salvage yard such as that run by Drew Pritchard on the Quest TV show 'Salvage Hunters.' I don't for one moment thing even drew would pay 3100 for a drain cover, so my guess is Amey have invented the £100 price tag to stop people wanting to buy them. Calvin, you need to get in touch with Amey again and ask them what their disposal procedures are for the items they remove? Can they be bought and if not, why not? You should also get in touch with John Hampshire and his team down at Kelham Island and express concern for Sheffield's rapidly disapearing historic artefacts. In the meantime I will give Nikki Bond a gentle reminder she should have contacted me. I understand election time is coming around, so it might be a good motivational force. A fine condition 1895 example - the only date in the 1890s that i haven't found is 1894. 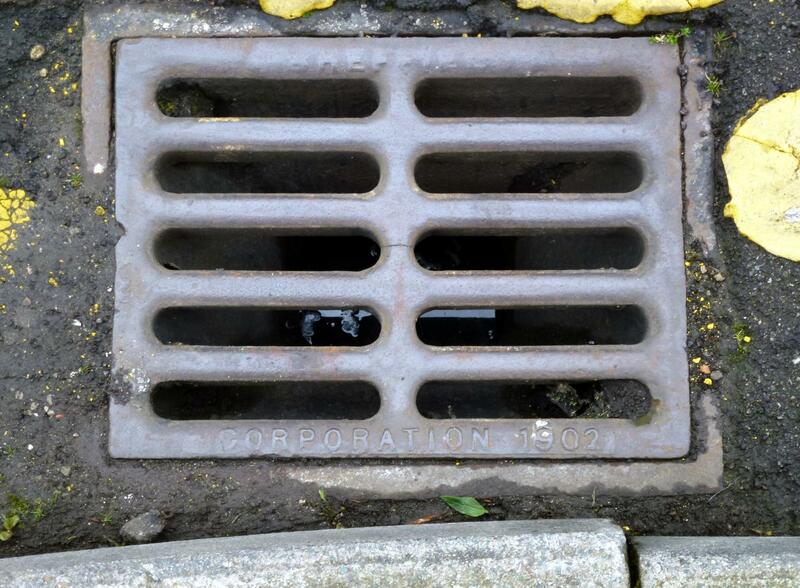 Its good to see interest in this subject,as an ex gully cleaner in sheffield ive had much experiance in maitenance of both old and new drains ,theres stil quite a few Gully covers showing many of the older foundarys which made covers . It would be good to see these preserved , as they may not be around much longer. We can't maintain the new ones so it doesn't make alot of difference getting rid of the older ones, the main problem is some of the older ones Known as number 4's are quite shallow and soon fill up with grit and leaves . Most had baskets in ,in the past which could be emptied . Also there unable to be jetted or rodded , but how many of the new ones ever get jetted anyhow , not many looking round . Thanks for your comments! 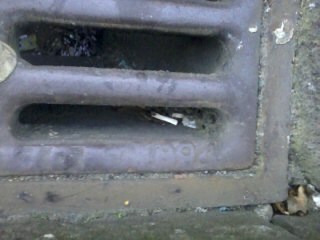 Can i ask if you have seen any older or more interesting drains? 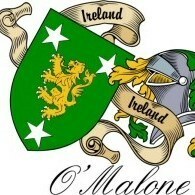 Any older date than 1890? Or any of the 'Sheffield Local Board' ones featured in that thread (not sure how to link but its still on the first page). Calvin - to link to a previous post anywhere on the site, Right click on the grey number in the top right of the post that you wish to link. (this one for instance is number 112) and click "Copy link Location"
Then - in your current post - highlight the text that you want to use as the link. About 1/3 of the way across the reply box, see the small icon which looks like a piece of a chain. Hope this is a good enough explanation. I have posted a pic of one of these from 1932 and it has been pointed out that they also exist in Endcliffe Park dated 1936. I have seen one in Attercliffe, Lower Walkley and the City Centre. I don't know what they are or why they appear in some places and not others. 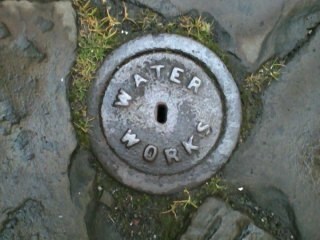 If they are not normal manholes over sewers then perhaps they might be "Lamp Holes". With the deeds of our house was a plan of the local sewer network. It included the local trunk sewer which runs across the sports field. Marked on the plan were manholes marked as "MH" but there was also an intermediate feature marked as "LH". This, I found, stands for "Lamp Hole". These were smaller vertical shafts placed to enable a lamp to be lowered down to the level of the sewer to ascertain if the sewage was flowing properly. they would only require to be big enough to allow the passage of the lamp, 'so perhaps the cover on top was of a smaller diameter. I wasn't able to find the "Lamp Hole" and cover because some-one has built a children's playground over it. Further to above I've just been looking at the "Picture Sheffield" historical maps drawing of the Sheffield sewers as of 1883 and it shows a 3 foot 9 inch by 2 foot 6 inch main sewer running straight under Endcliffe Park. It also shows a main sewer starting yards from the site of the Lydgate Lane feature. 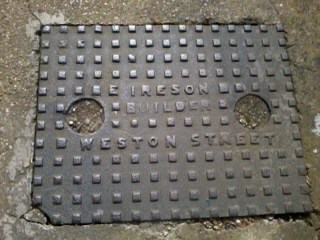 I think that they were perhaps the replacement man-hole covers in use in the thirties. 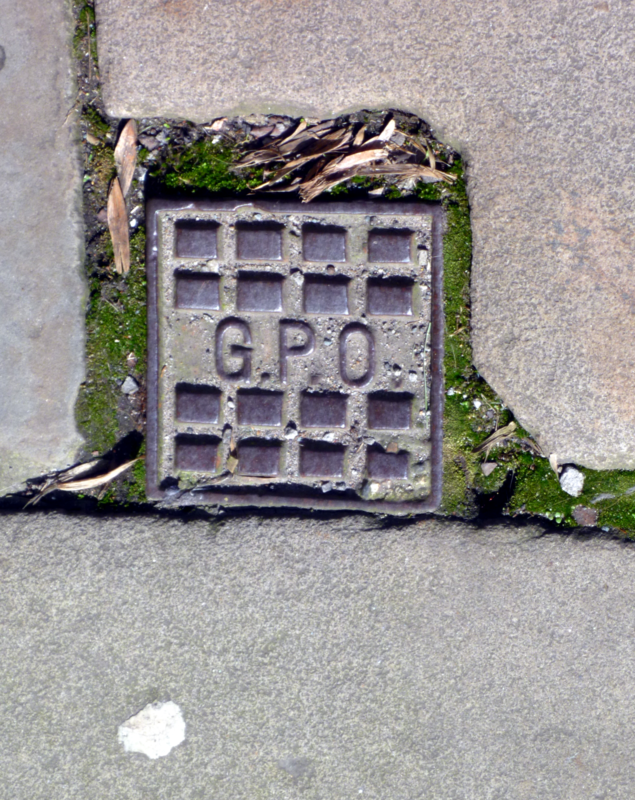 More of a access cover than a drain on St James Row, its around 4" square. Don't worry - the definition of 'drain' is pretty stretched already! There's a "Victorian" post box or a facsimile on the Cathedral forecourt. As my research reveals interesting patterns of dates across areas of the City, this is the breakdown of 1890s drains, which either says something about the installation pattern or the survival rate of particular year's examples. They appear to be of similar or identical quality so i believe that survival rates have been reasonably consistent across Sheffield (as long as there has not been any major clearance programmes etc). Corporation of Sheffield 1890 - 7 or 8 (four in one small Sharrow street) - also one behind the Children's Hospital. 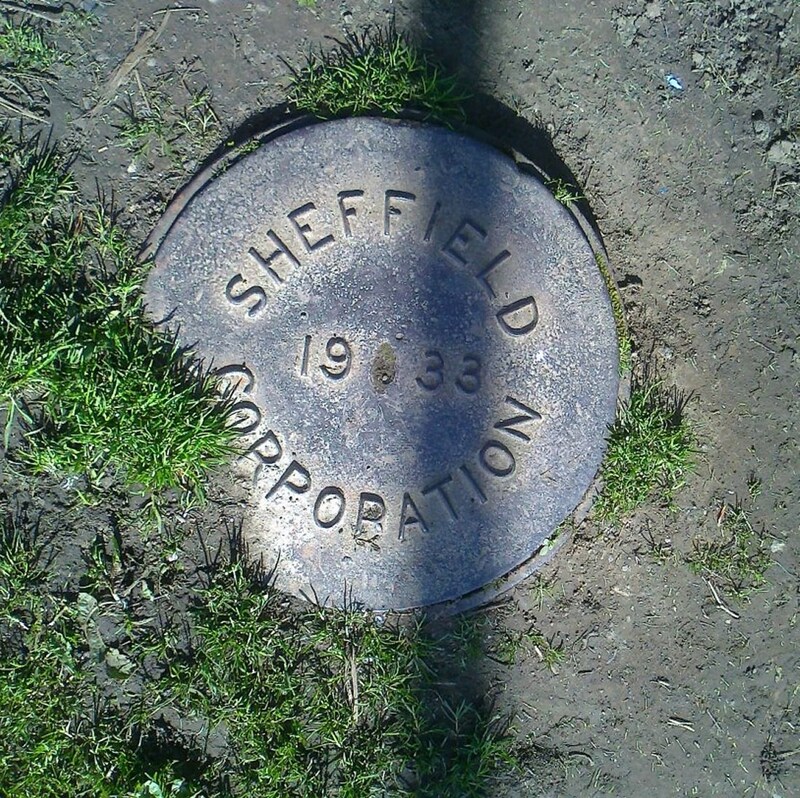 Sheffield Corporation 1891 - 1 (also Sharrow). 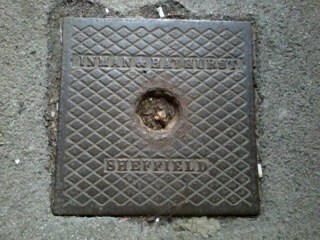 Sheffield Corporation 1892 - 7 or 8 (in or around the City Centre). Sheffield Corporation 1893 - 4 or 5 (mainly Kelham Island). Sheffield Corporation 1894 - 1 (above). 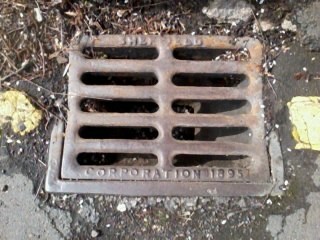 Sheffield Corporation 1895 - 6 or 7 (various) - also a pair of nice examples behind the University 'Information Commons'. Sheffield Corporation 1896 - the first common date, 50 or more. 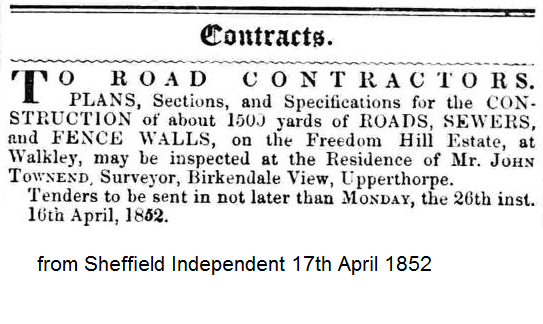 Sheffield Corporation 1897 - likewise, 100 or more. Sheffield Corporation 1898 - more numerous again, probably 200 or more. 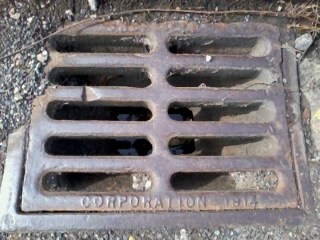 Sheffield Corporation 1899 - also 200 or more. These are the approximate numbers based on examples i have actually seen - actual survivors numbers may be a lot higher. But there is a clear pattern of a change in policy or method from 1896 which is something i noticed right at the top of this thread - now we are just putting some 'meat on the bones'! And getting a lot of exercise into the bargain Calvin.